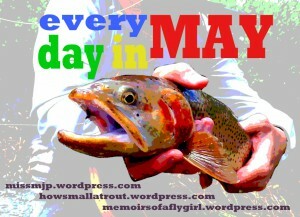 Home » Fly Fishing » Every day in May – check it out! Every day in May – check it out! It all kicks off tomorrow, are you going to join in? EDIT: So I’ve been thinking about this over the last 5 minutes and for starters I realised that it kicks off in two days time and not tomorrow (more study time!) and secondly I think I’m going to challenge myself to post a photo every day in May that captures something of what happened in the day or something that goes along with the blog post – should be interesting if it doesn’t turn out rubbish!! Way to take the challenge! Best of luck!